The new year at Kay St. Germaine got off to a busy start. We had a state visit from the first lady, Madame Martelly, we commemorated the third anniversary of the earthquake, “Team Canada” brought lots of essential new chairs for our children, and the education and rehabilitation staff participated in a two-day intensive training seminar in their respective fields. 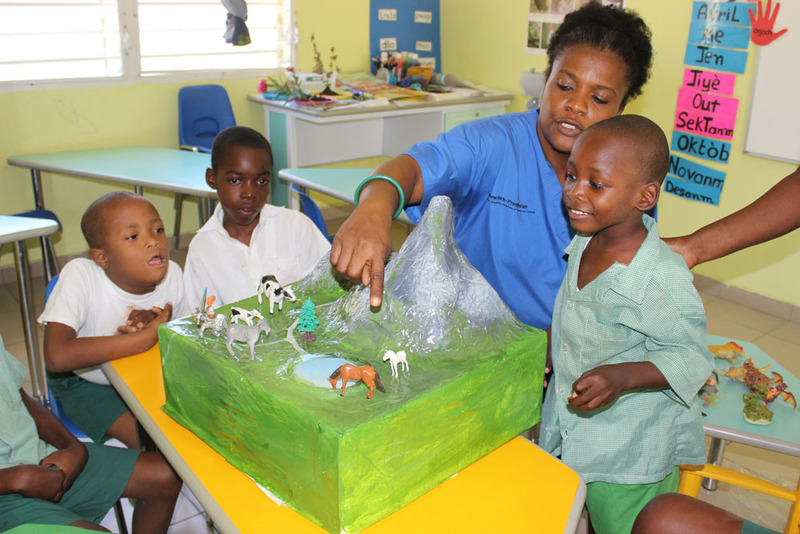 The students in St. Germaine School started 2013 off with a theme focusing on geography. Professor Magalie with Samsters and classmates. Samstearns and his classmates had lots of fun learning about cool mountain streams, raging rivers, and small and big lakes. This was a good introductory lesson before going on to more advanced topics such as volcanoes and earthquakes. 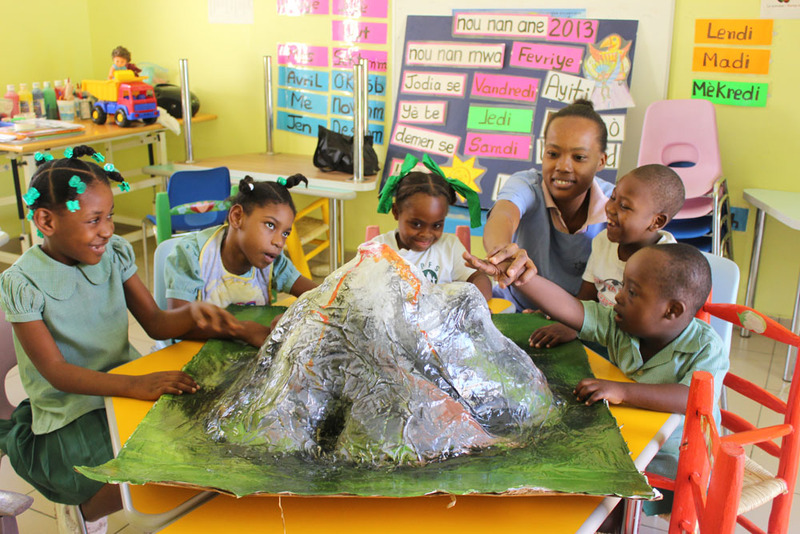 Professor Valerie teaching a lesson on volcanoes. 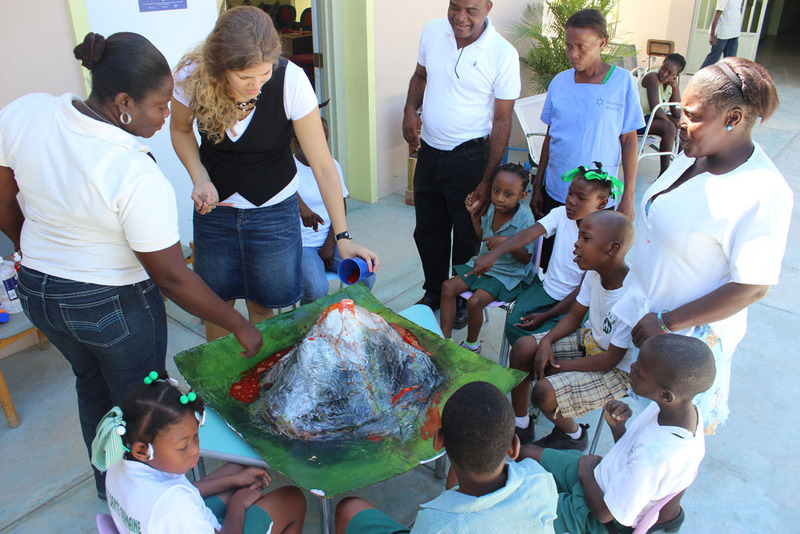 Professor Valerie used a paper mache model of a volcano to help students make sense of this exciting and complex topic. She encouraged them to experience it tactilely, visually and creatively. Each class participated in a demonstration of a volcanic eruption outside in the school courtyard. Kristine, our speech language pathologist from the US, created a live eruption for the students using baking soda, red ink and vinegar. Afterwards, students returned to their classrooms and were encouraged to communicate and reflect on their experience. 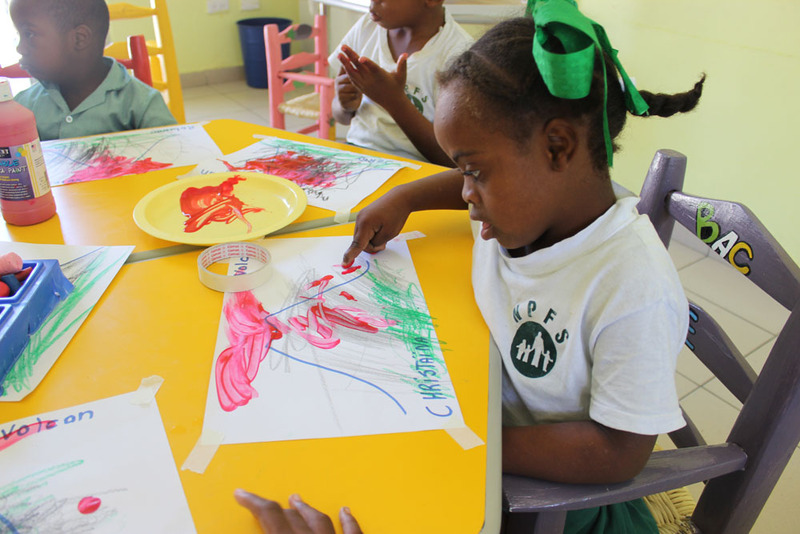 Professor Valerie’s class, who are at early stages of basic communication, expressed their experience through the use of art, which is essential for developing memory, fine motor skills, and creativity. “Team Canada” seating and positioning specialists, in association with Healing Hands made their second visit to Kay St. Germaine. They brought with them over 20 quality wheelchairs, five of which they fitted for children with disabilities for the NPH St. Helene Orphanage in Kenscoff. Sadrak receives his new chair. During their three-day visit they set up new seating systems for the children and one of the accounting personnel, Sadrak who lost both his legs in the earthquake. 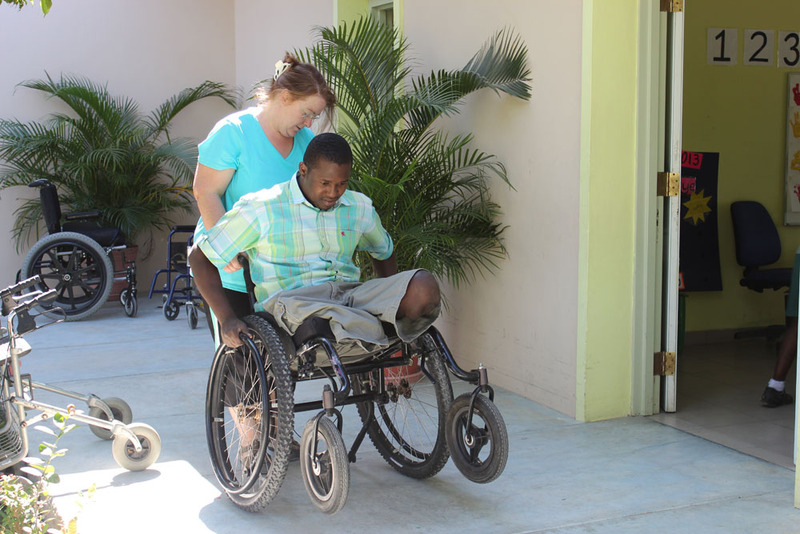 This will significantly impact Sadrak’s life because the terrain around his home is very rugged and long-lasting durable chairs are hard to come by here in Haiti. Roselan smiling in her new chair. Other worthy beneficiaries from this team’s wonderful work and donations were little Roselan and her mother, Dilaine. 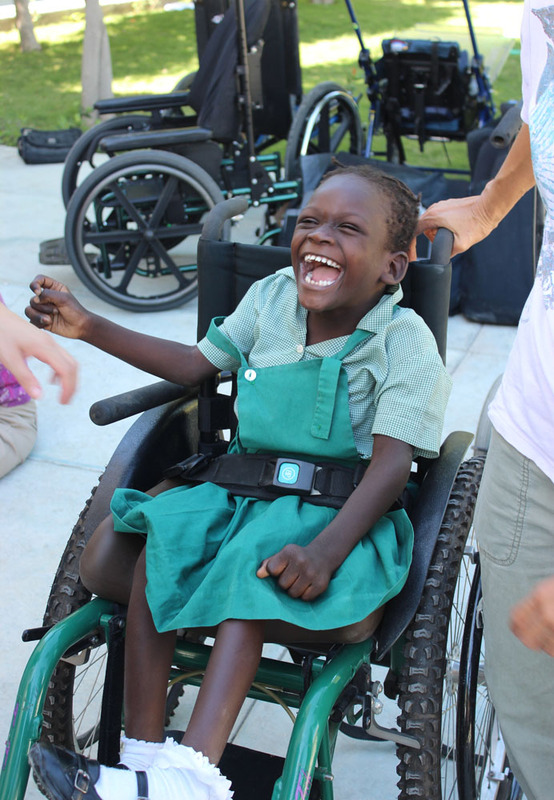 The team worked tirelessly to assemble and custom fit the chair for little Roselan’s body. Both mother and child were overjoyed. This chair will make a world of difference in both their lives. Dilaina explained that they live far away in the countryside. And that this new chair means that she can now bring Roselan with her to the market and to church. Dilaina told us she is so proud that now she can have Roselan sit next to her as she sings in the church choir every Sunday. 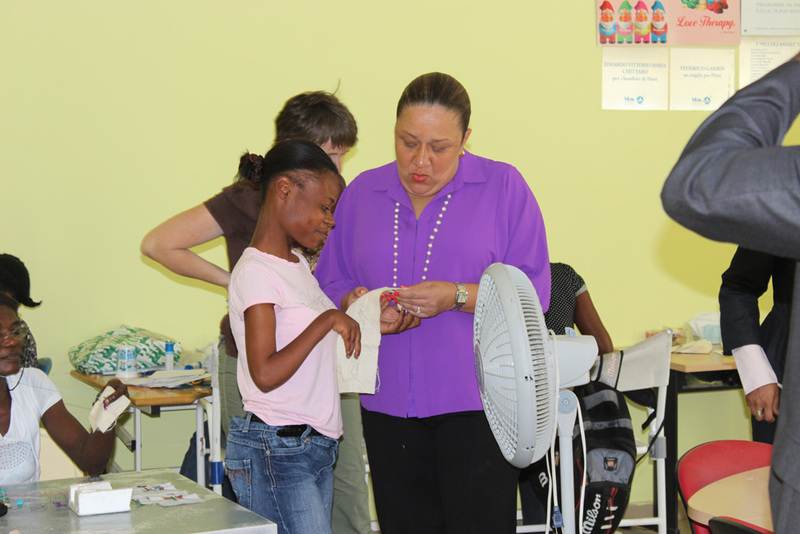 Haiti’s first lady, Sophia Martelly visited our center during the month of January to tour the facility, meet with staff, and learn about Kay St.Germaine programs. Gena Heraty, Special Needs Director, escorted her around the various programs. She was very impressed with the quality of services being provided and spent some time in the small crafts workshop speaking with Darlene, complimenting her embroidery. Darlene grew up in the St. Helene orphanage and has a physical disability. She now works alongside the women in the craft project, an employment initiative set up to provide the mothers of the children with disabilities an income so they can provide for their families. We appreciate the fact that she took time to visit and learn about the value of Kay St. Germaine’s education and rehabilitation programs. The 2013 training seminar in special education. 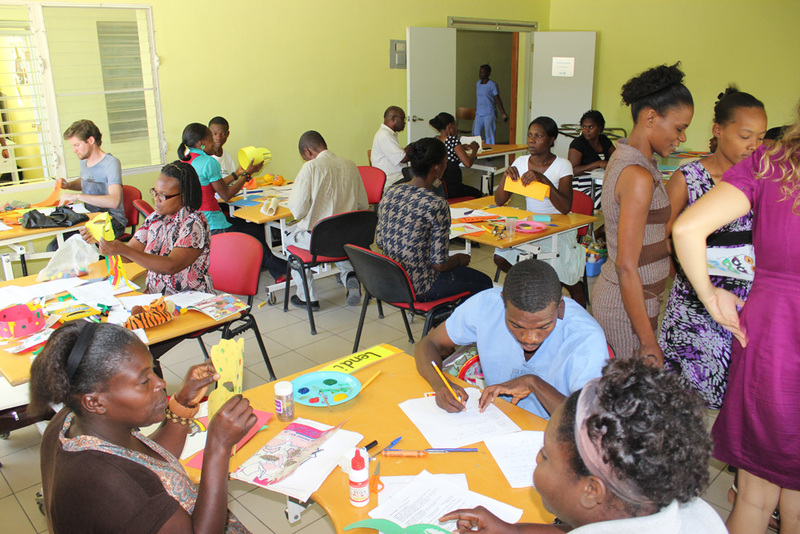 In 2011, Kay St. Germaine launched an initiative to improve the quality of rehabilitative services by providing monthly intensive training seminars for all the rehabilitative personnel. Due to its success this initiative was extended to include intensive training for all education personnel. The development of caring, creative and competent professionals in their respective field is a fundamental aspect of this initiative. January’s training goal was to maximize learning in ongoing, everyday situations and to increase a student’s functional and communication skills so they may reach their potential and lead more independent lives. Contributed by Liz Lawne, volunteer.